It has been another busy month for us here at Academy Driver Training.On March 18th Abi Pickard of Pocklington passed her Driving test In York . well done Abi !! Another success on March 25th Chris Hornsey from Pocklingon School passed. Congratulations Chris. And finally today At York Test Centre, after a cancellation due to bad weather. 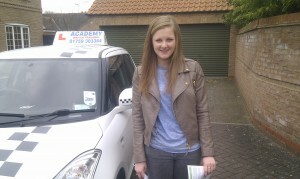 Lucy Orton of Stamford Bridge passed first time. Very well done Lucy. Another First Time Pass ! !